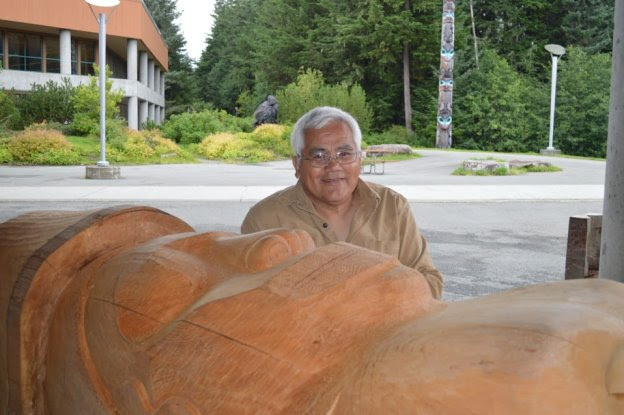 Wayne Price, Tlingit Master Carver from Haines, Alaska, has joined the University of Alaska Southeast as Associate Professor of Northwest Coast Arts. An accomplished Alaska Native artist, Price is a member of the Wooshkeetaan clan. He has carved over 30 traditional and non-traditional totems. He owns the Silver Cloud Art Center in Haines, and is a featured artist in the Egan Library Northwest Coast Art Collection. In addition to totems, Price uses his Master Carver skills to create canoes and paddles, masks, boxes, drums, and regalia for dance and ceremonies. He has been carving since 1971, and has been an apprentice under other master carvers and artists, including Ed Kasko, Leo Jacobs, and John Hagen. His art is featured throughout the world. UAS currently offers a Northwest Coast Arts occupational endorsement and, this fall, UAS will offer several arts courses, including Intermediate Design and Beginning Carving. Also available is a survey course in Northwest Coast Native Art History & Culture which explores the visual arts of the Northwest Coast Native peoples. It will feature traditional methods, materials, and images discussed within a cultural and historical context. In addition to Alaska Native arts and language classes offered for academic credit, those same classes can be taken by community members at a reduced rate in a non-credit format. This intended for community members not otherwise enrolled in a degree or certificate program at the university. Classes at UAS begin August 27. For more information about Northwest Coast Arts educational offerings, visit uas.alaska.edu/schedule, or contact program coordinator Davina Cole at 796-6340.